Our house is covered in glitter. There was a small explosion from one of the bigger glitter containers and now our house is disco. No matter how much you clean and vaccum, the glitter remains. Very pretty, but very scratchy when it gets into socks. Echo’s Lost is kicking along. Two of the works are already in the mail! I’m so looking forward to this show. It’s been a really easy ride this time around actually, after the 4 months of hard work for Totem, this one is breezing by. Every artist this time are well acquainted with exhibitions and all but one I’ve worked with before, so it’s beautiful. Remind me to organise small exhibitions all the time! Fliers arrive this week and, for the first time, I’m going to pay someone to distrubute them. I’ve done a LOT of walking into cafes and asking to put down fliers over the years and this year I’ve decided that I’m too old and too busy to do it. So I’ll pay someone else too. It’s a big chunk of time and effort I can save, so I’m all for it. 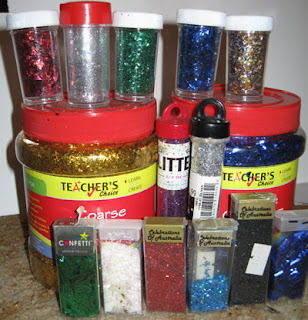 That coarse glitter is like industrial strength crunchy! It's incredible, isn't it? Some of the bits are less like tiny glitter and more like huge hulking mutants here to take over the world, starting with my house. They get everywhere. Currently I can pulled washed clothes out of the machine or clean trays out of the oven and find them winking and glittering like fairies.